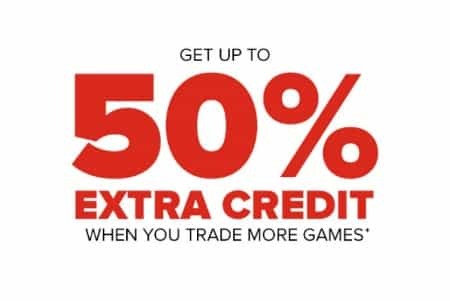 Hurry in and get up to 50% extra credit when you trade more games in store. Offer valid 6/18/18 – 7/8/18. Offer valid for game trades only. Not valid toward cash trades. Trades must be in full working condition to receive full value. Defective items may be eligible for trade at a lesser value. Trades subject to manager approval. Cannot be combined with any other offer. See store associate for details. No dealers. Offer valid in the United States and Guam only. Void where prohibited. GameStop, Inc. reserves the right to cancel, terminate, modify or suspend the offer for any reason without notice.